EchoLink.ru :: Конференция AMSAT, VoIP 2004г. Voice over IP radio gateways have brought many new capabilities to Amateur Radio operation in the past 5 years. One application that would be extremely beneficial to the ARISS program is the direct connection between a school and a remote AMSAT ground station tracking the ISS, using nothing more than a notebook computer from the classroom. Currently, half the schools wishing to participate in ARISS contacts do not have a local satellite ground tracking station available to enable a direct ARISS contact. Even when available, some schools may not have an appropriate location for the satellite tracking antennas in proximity to the staging area. An alternative to a direct ARISS contact for only 27% of the schools has been a telebridge phone patch. In a telebridge conference the visibility and excitement of amateur radio is lost and amateur radio equipment and operators are not visible. It is desirable to have a stronger amateur radio presence for those situations where a direct contact is not possible. It is also desirable to expose students to more current and interesting technologies that are relevant to their future. These scenarios can be easily overcome by a simple Voice/IP connection made from the school to any one of a number of existing Amateur Radio satellite-tracking ground stations throughout the world. A notebook PC at the school is all that is required by a ham operator at that location. Similarly at the other end all that is required is a PC connected to a radio tracking the ISS. The advantage of using a notebook PC at the school is their portability, they are readily configurable, and can be easily connected to a video projector to present visuals such as tracking software and flight information allowing all students to see what is taking place. The PC also maintains positive PTT control for the duration of the event. Taking advantage of existing satellite tracking stations throughout the world would also allow for greater flexibility for the ARISS program administrator who schedules these contacts. Most importantly the quality of the communications is conveyed in a digital format over the Internet, ensuring the reliability and improving the voice quality of that long awaited contact between the students and the astronauts. There are several free Amateur Radio Voice/IP software applications available today that are extremely reliable. The most popular application is Echolink, which can be downloaded from http://www.echolink.org . Echolink would be run in the single user mode on the notebook PC. At a remote ground station it would run in the sysop mode on a PC connected to a VHF radio tracking the ISS. Echolink does not require a lot of bandwidth and can be used over a local dial-up or direct Ethernet connection. Another advantage of this software is that the connection can also be tied to an Echolink Conference Server allowing any number of non-participating users or ARISS program administrators to monitor the event right from their PCs. Other Voice/IP gateways such as web streaming audio and IRLP can also be brought in as needed. This scenario can be viewed in the following diagram, outlining a conventional single school contact. The capability also exists to allow multiple schools to participate in a single event and to extend the contact window to the ISS by using multiple ground stations conferenced together. Two-way audio paths would only be allowed for direct participants. Indirect participant's upstream audio would be muted. This is commonly done on large Echolink directed nets. 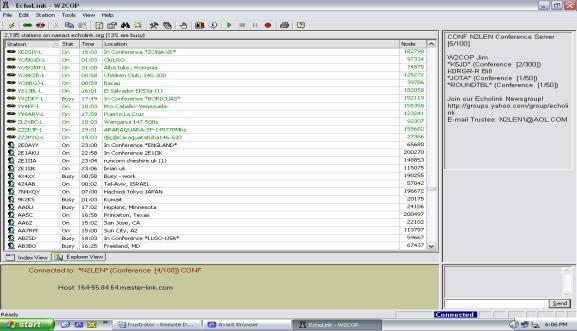 In the following Echolink screen shot you will see stations linked to remote base radios listed as –L in green lettering. The stations listed in black are single users. You will also see several Conference Servers chained together in the right hand pane, allowing more users. This Voice/IP concept using Echolink was tried during a September 2003 ARISS contact from a school in Webster, NY. The tracking was done in the background during the event by five ground stations from coast-to-coast to test reliability. Communication from the ISS was actually extended to a 27 minute window. This experiment has debugged many considerations for applying the technology to future ARISS contacts. The desired goal is to enhance the Amateur Radio experience in the school and to enable every school to have an equal chance to participate in the ARISS program using this technology and applied concept. (Live demo to follow with question and answer period).